Great source of food. A very wide family of plants found all over the world that taste like spinach, including quinoa, pigweed, Amaranth, lambsquarters.. Leaves taste like, and can be used to substitute domestic spinach in any recipe. One of the most nutritious delicious greens there is, even better than spinach. Used a long time ago by farmers to fatten up their livestock. The matt, light-green leaves resemble the shape of a goose foot and have a white, powdery underside. Stem tops are covered with tiny greenish yellow flowers that become seeds. The grain seeds are gluten free and can be used in soups, salads, stir fries, and can be used to replace wheat flour. There is no reason to go hungry when this amazing wild plant is around. Soak seeds in water for 8 hours. Seeds are ripe when they fall from the plant when shaken or rubbed. There are many different varieties of this amazing family, here are some... Lambsquarters C. album- both wide-leaf and narrow-leaf, Bluebushes(Australia), Strawberry Blite-C. capitatum, krouvida, ??? ?ß?da (in Greece), Mexican Tea-C. ambrosiodides, Quelite(Mexico), California Goosefoot-C. californicum, Oak-leaved Goosefoot-C. glaucum, Upright Goosefoot C. urbicum, Maple Leaf Goosefoot-C. hybridum, C. simplex, Good King Henry-C. bonus-henricus , Many-seeded Goosefoot-C. polyspermum, Desert Goosefoot-C. pratericola. There is a variety in India called “Tree Spinach” C. giganteum with a magenta color in the center, that grows to 9 ft tall! (3m) and is totally edible. The Strawberry blite variety looks like it has what appears to be berries, but are actually tightly crinkled red flowers that taste like spinach. Some people may be allergic to Goosefoot pollen. Has oxalates, so people with kidney stones, rheumatism or arthritis should be cautious. TOXIC LOOKALIKE- Hairy Nightshade- is hairy (Lambsquarter is not) Doesn't have white powdery coating like lambs quarter. Hairy nightshade flowers are the biggest distinguishing factor- they are white and much bigger, as opposed to tiny greenish lambsquarters flowers. 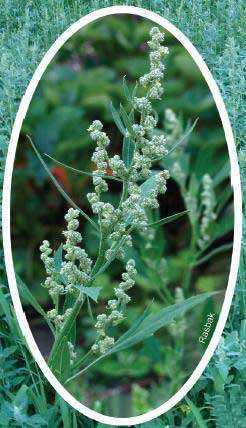 Another similar plant, the NettleLeaf Goosefoot (Chenopodium murale) , is considered by some to be toxic because of its high levels of oxalates, but other people are just fine with it, depending how healthy you are (no kidney problems or stones). This plant has somewhat shinier leaves, a reddish stem and it smells bad. (goosefoot), a genus of plants of the family Chenopodiaceae. They are annual or biennial herbs; they are sometimes subshrubs, shrubs, or, rarely, trees. The leaves are alternate. The flowers are mostly bisexual; sometimes there are some pistillate ones. The flowers are gathered into glomerules that form spicate or paniculate inflorescences. The perianth is two- to five-parted. The fruit is monospermous. 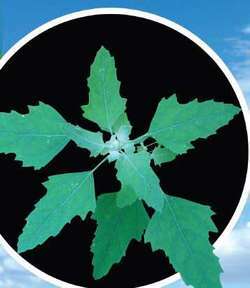 There are over 200 species of Chenopodium, distributed primarily in the temperate zone. Approximately 30 species, many of them weeds, are found in the USSR. 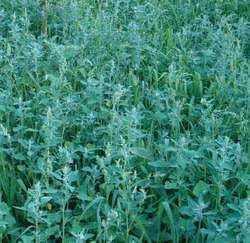 Lamb’s-quarter (Chenopodium album), a weed used as cattle feed, is widely distributed. 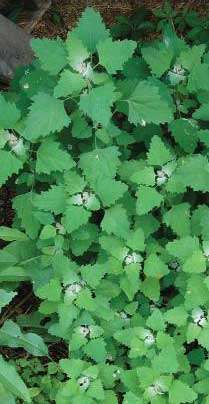 The leaves and young shoots of lamb’s-quarter and other species are used in salads and soups. The succulent red glomerules of strawberry goosefoot (C. foliosum) and strawberry blite (C. capitatum) are sometimes used as food and for coloring wine. Sowbane (C. hybridum) is poisonous to hogs. The species C. anthelminticum and Mexican tea (C ambrosioides) which are native to tropical America, are cultivated in the Ukraine and the Caucasus; they contain, primarily in the fruits, chenopodium oil, which is used as an anthelminthic. Quinoa (C. quinoa) is a high-altitude grain crop, raised mainly in Peru and Chile. The species C. purpurascens is cultivated as an ornamental.